Cutting-edge Wireless inductive technology simplifies charging into just setting your phone down on the charging pad. Fast Charge Mode delivers 10W charging to fast wireless charge-capable device. Breathing LEDs indicate device and charger status. Indicator will not turn off when charging is complete. Non-slip charging pad keeps devices secure. Sleek, compact build takes up minimal space. Using your device while charging or misaligning the device and charger may cause higher temperatures. Remove protective cases to ensure effective charging. Fast Charge Mode compatible devices include: Samsung Galaxy S9 / S9+ / S8 / S8+/ S7 / S7 edge / S6 edge+, and Note 5. Quick Charge 3.0 wall adapter required for Fast Charge Mode. Samsung S9 and S9+'s wall charger is not compatible with Qualcomm Quick Charge Mode. Will PowerPort Wireless be able to charge iPhone 8 / 8 Plus / X at 7.5W speeds? The PowerPort 10 Wireless Charger will fast wireless charge Samsung Galaxy S8/ S8+/ S7 / S7 edge / S6 edge+, and Note 5, it will charge other Qi-enabled devices at 5W, therefore it will not charge iPhone 8 / 8 Plus / X at 7.5W speeds. Does wireless charging affect other wireless devices? Is radiation from wireless chargers harmful to one’s health? The PowerPort 10 Wireless Charger only emits non-ionizing radiation which is not harmful to humans. What's more, it's certified with FCC, CE, RoHS, etc. What if the PowerPort 10 Wireless Charger is not charging my device(s)? 2. Check to ensure that the AC adapter you're using with the PowerPort 10 Wireless Charger has an output of 2A or more. 3. Check to ensure that you are placing your phone on the center of PowerPort 10 Wireless Charger. 4. Check to ensure the phone is not in a 3mm or thicker case when charging. 5. Check to ensure there is no metal obstruction on the back of the phone/phone case, or credit cards inside the case. 6. The PowerPort 10 Wireless Charger's cable may be faulty. Try using a different cable. If the problem persists, please email us at support@anker.com to claim your 18-month warranty. Request sent to owner. 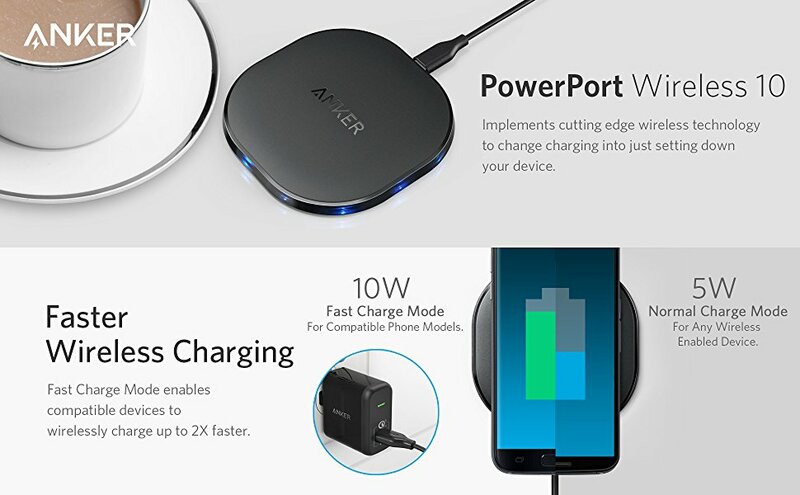 What kind of AC adapter should I use with PowerPort 10 Wireless Charger? Make sure that the AC adapter that you use has a minimum output of 2A, otherwise your devices may not charge properly. And for fast Charge Mode compatible devices Including Samsung Galaxy S8/ S8+/ S7 / S7 edge / S6 edge+, and Note 5, we recommend using QC 3.0 Chargers, so that the wireless charger can charge these devices at 10W. Can I use a different USB cable instead of the cable that comes with PowerPort Wireless 5 Pad? Yes, other Micro USB cables can be used, but to ensure the utmost safety and performance, we strongly recommend using your device's original cable (OEM) to charge your devices with the PowerPort Wireless 5 Pad. What does PowerPort 10 Wireless Charger's LED indicator show while charging? "Turning on: Flickers for 3 seconds and turns off if there is phone attched. Charging:Flickers for 10 seconds when start charging your phone and remain unlit in the charging process Not recognized:If the phone is not recognized or sth wrong with the charging, it will quickly flicker."